An X-ray test is a quick and painless way for doctors to diagnose and monitor many health conditions. X-rays are a form of low dose radiation, therefore requests for these tests can only be accepted from your family doctor, consultant or another suitably qualified healthcare worker e.g. Physiotherapist. For women of child bearing age it is preferable if these examinations are performed during the first 10 days of the menstrual cycle. An X-ray machine is operated by a trained radiographer, and works by projecting a beam of X-rays through part of your body. These are subsequently detected by an X-ray sensitive detector, which creates an image. This image is stored digitally and is displayed on a computer screen, enabling a Consultant Radiologist to study the film and send a report on the findings to your referring doctor. 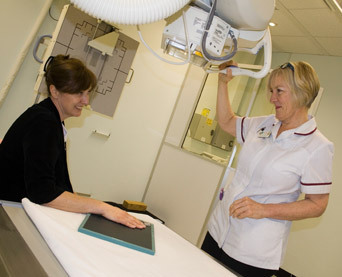 X-ray tests are frequently used to assess bones and joints for injury and arthritis. A chest X-ray is part of the routine assessment of heart and lung problems. It may also form part of an assessment prior to a general anaesthetic. Abdominal X-rays can be useful for identifying kidney stones.